Crush Date: Is Biguesas Playing Natasha? Say what you will about the Rubies but you certainly can’t accuse them of not being full of surprises. Last night they bestowed their former Housemate Biguesas with the honour of most crushes. Even he could not hide the shock on his face when Biggie announced the results this evening. And it looks like the Angolan is a man whose heart is torn in two as he first picked Maria to go on a date with but then changed his mind and picked Natasha. This was a decision that was met with both shock and excitement from the rest of The Chasers who were watching his Crush Diary session on screen. After his Crush Diary Biguesas seemed to still be in two minds about whether or not he made the right decision. “She knows that I like Maria and that is why she had me sent here,” he dished to Hakeem about Natasha. “If you like her then I will learn to like her too,” Hakeem assured him. At this statement Biguesas merely shook his head. What is going on here? Why did Biguesas choose Natasha when he clearly has feelings for Maria? 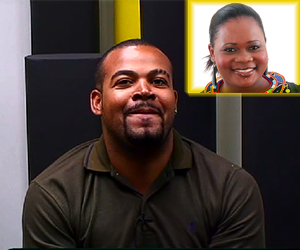 Could it be that the Angolan has something up his sleeve for Natasha? After all he was part of the group of Diamonds that were plotting to take Natasha out of The Chase. We can’t wait to see what will go down when this two do get together.